In this video I complete the Android Translation app! I provide both an Android Text to Speech Example as well as a Speech to Text example. I also review how to use Spinners. By the end we will be able to say a phrase, translate it into multiple different languages and then press a button and have those translated phrases speak. All of the code follows the video below. 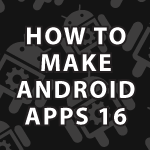 Great tutorial and nice little app. I watched it but have not built it locally yet. I was wondering why you said Android does not support all the languages in the TTS list, and you chose only those 6 in question. Why for example the Chinese was not implemented for this tutorial? Sorry if I’m asking a dumb question. The Chinese language shows up in the Local class, but not in TTS. They show all the available tts languages here. I suppose it’s because your web service translator does not extend to these other languages? Sir,can image be send to android via json? Thank you for all the work you’ve put into the Android Studio tutorials. I am having trouble embedding videos into my app and getting them to play on a device. I have working examples of playing videos from a remote server, but need to include videos in an app. If you can help me get this going, I will save you a warm spot in heaven. Never mind. I got it working. Thank you so much for all the great tutorials. You still get the complimentary warm spot in heaven. Great I’m glad you fixed it. Sorry I couldn’t get to you quicker. I’ll try to make a video on that topic this week. Could you make a Navigation Drawer tutorial. I’m having trouble taking the info from the selected button and inflating the appropriate fragment.